Tune in this weekend to catch the FFWCT's Flag Football National Championships on Fox Sports Southwest, Fox Sports Ohio, Fox Sports Sun or NBC Sports Chicago! With over 100 teams represented and some of the top teams in the country, Battle Orlando was a huge success and amazing weekend for everyone involved. We're excited to show the world through the television broadcast what flag football looks like at it's highest level. The Flag Football World Championship Tour (FFWCT) kicked off the Battle Orlando Flag Football National Championships on Saturday, the 27th, that continued through the main event on Sunday. The 4v4 championship game featured teams from Jacksonville and Miami, FL, and will be televised on Fox Sports and NBC Sports on February 24th and 25th of this year. Travis Burnett, Co-Founder of the FFWCT, had this to say about the event itself. 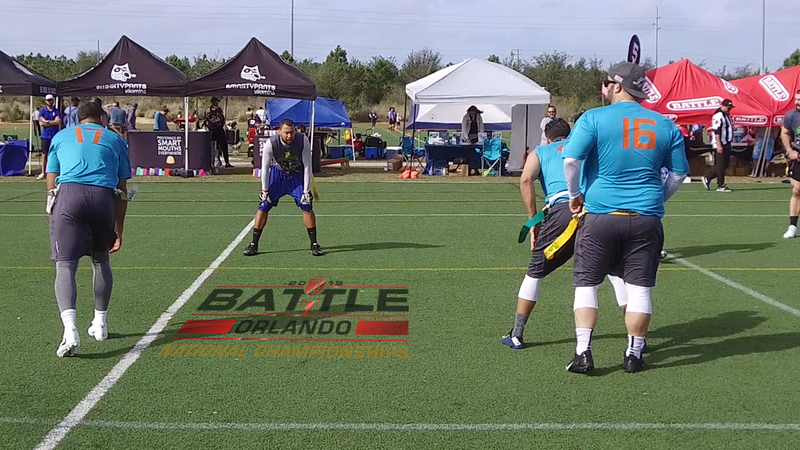 "With over 100 teams represented and some of the top teams in the country, Battle Orlando was a huge success and amazing weekend for everyone involved. We're excited to show the world through the television broadcast what flag football looks like at it's highest level as we continue to push for the growth of the sport." FFWCT teamed up with Focused TV Productions along with multiple NBC Sports and Fox Sports Networks provide televised access to the many flag football fans who can’t make it to the tournament, and those who want to relive the experience. James Bates, who led the Florida Gators to their 1996 National Championship, and has since won three Emmy Awards for his broadcasting talents, will give the play-by-play. The main event can be viewed on Saturday, February 24th and 25th at various times, depending upon the viewer’s regional network. Charles Davis, Co-Founder of the FFWCT, has huge optimism for the future of the sport. "Never in a million years would I have dreamed it would have grown this big this fast, Travis and I are blessed to see this through. It's now on a level that has never been achieved before so we just want to keep pushing the frontiers and keep pushing the envelope to see how far we can actually take the sport." In addition to the televised championship game, the flag football tournament features divisions for men and women of different ability levels and team sizes, and children of various age groups. Many of the division champions receive cash prizes, with a total of $15,000 at stake. All division champions receive trophies. All the games take place at Northeast Regional Park in Davenport, Florida, while next years tournament is already scheduled for Martin Luther King weekend, January 17-20 at Austin Tindal Park in Kissimmee, Florida. For 2018, the FFWCT has over 30 regional tournaments planned all across the nation, youth and adult, including their World Championships coming up this July 28-29,2018 in Indianapolis, IN. More information on that event can be found on the Battle World Championships page here. Interested parties can find out more information by visiting http://www.ffwct.com.